Teaching Videos – Comprehensive online insurance courses available 24/7 on any device. Our streaming videos simulate live lectures but let you set the pace that’s right for you! Hard Copy Textbook – Included with each course, our textbook works in conjunction with the lecture videos. 45-Day Online Access – If you need more time, simply call us, and we will extend your access for free until you pass your exam. Sample Questions and Practice Exams – Helps reinforce the knowledge you gained from the video lectures! Customer Support – Our first-rate customer support team is here to answer all your questions and make sure you have everything you need! Watch a few sample lectures to see why more students succeed with AP! We offer a variety of insurance pre-licensing courses ranging from property & casualty to life & health. Our testimonials speak for themselves—see what our past students have to say! You join the ranks of one America’s most enduring and flexible careers. It’s a profession that combines excellent earning potential with the opportunity to make life better for people every day. You sell products that are truly needed. Most Americans would be in serious financial trouble if they had a major loss and were uninsured—if their home was destroyed in a flood or they faced a catastrophic illness, for example. The products you’ll sell as an insurance agent can be literal lifesavers for your customers. You have the ability to control your own schedule. Many insurance agents who build their own practice can set a schedule that works for them. You have the opportunity to help people every day. More than just selling a product, as an insurance agent, you help empower and bring peace of mind to your customers. You’re a principled trust builder. You have the opportunity every day to put yourself in your customer’s shoes and provide them with the information and products that will best serve their needs; over time, you’ll build a reputation as a trustworthy and respected insurance agent. You’re able to meet a variety of needs: Insurance agents who are dual-licensed (e.g., property & casualty and life & health) are able to do even more for their customers, helping customers obtain several products, such as homeowner’s insurance, auto insurance, and life insurance, for example. 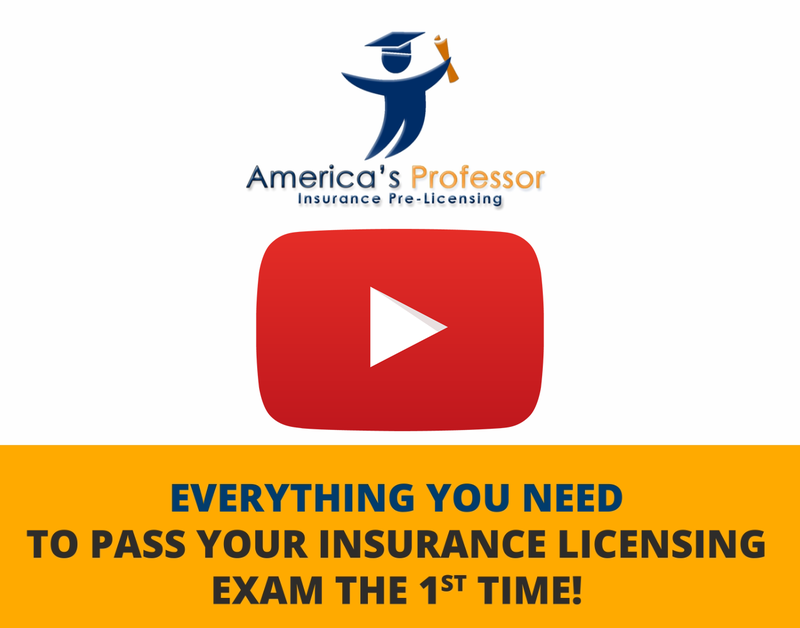 America’s Professor offers a variety of insurance license classes that will help you prepare for your insurance test and obtain your insurance license. The pre-licensing courses we offer include: property & casualty, life & health, accident & sickness, allied lines, property (alone), casualty (alone), and other variations, depending on your state. Thanks to our highly effective insurance exam prep courses, you can take your exam with confidence. We offer both state and national insurance pre-licensing courses. Don’t see a course for your state? We also regularly add new courses, so check back often. You’ll soon discover why America’s Professor should be your go-to provider for insurance exam prep. Does AP’s insurance exam prep make the grade? Our courses are engaging, easy to follow, and available entirely online. Best of all, you can take these courses on your own time. Getting ready for your insurance license exam has never been easier. America’s Professor offers the best insurance agent exam prep in several states across the United States. Becoming an insurance agent does not have to be difficult—all you need are the right materials and training. With the insurance licensing classes through America’s Professor, you will! America’s Professor presents a unique approach to learning design to help you pass your license exam the first time. Great course. Videos do a good job explaining the material. Lays out what you need to pass the test.